In the second installment of the SPLICED series, sixteen-year-old Jimi Corcoran risks her life to clear a friend's name--and uncovers the horrific truth about one of the most powerful men in the world. All Jimi wants is pick up the pieces of her life and move on. She never intended to uncover a conspiracy, or become a hero for chimera rights-- she just wanted to protect her best friend, Del. But now she's a public figure, and she can't quite shake the spotlight. . . or her suspicion that she's being followed. Still, when a strange chimera shows up, half-dead with nothing but an odd hospital bracelet to identify him, of course Jimi tries to help. But everything goes wrong-- and her friend Dr. Guzman is arrested for murder. Desperate to prove his innocence, Jimi does some digging, and discovers that the sick chimera came from a hospital owned by Howard Wells. . . . The businessman who pioneered the Genetic Heritage Act, which sought to label all chimeras as inhuman, and undeserving of basic rights. Has he really had a change of heart? Teaming up with her chimera friends Rex and Claudia, Jimi sets out to investigate Wells' hospital-- but discovers the seemingly-charitable endeavor is hiding an extensive, dark secret. To save lives and shut down a criminal operation, Jimi and her friends will have to risk everything-- and incur the wrath of Howard Wells himself. Action-packed and haunting, this sequel to Spliced digs deeper into a gritty, near-future world in which lawless science is a rich man's game-- and Jimi and her friends are unwilling players. Jon McGoran has written several books for adults, including the D.H. Dublin series and the eco-thrillers Drift and Deadout, which Publishers Weekly called "outstanding" in a starred review. Jon McGoran is also a founding member of The Liars Club, a blog for and by writers. 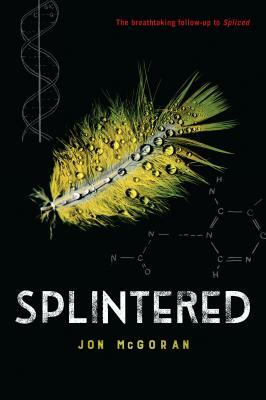 The Spliced series is his first young adult project. He lives in Pennsylvania with his family.